Sea salt sounds exotic, doesn’t it? Therefore it must be better for you than regular table salt, right? What about kosher salt? It must be healthier too, right? Truth be told, the best salt to use isn’t necessarily the one that is in the news or has a catchy name. Sea salt, table salt, and kosher salt are comprised mainly of sodium chloride. 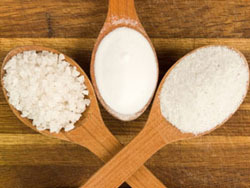 Sea salt is evaporated from seawater so it also has trace minerals such as copper, calcium, and magnesium. Table salt is mined from salt deposits that are underground, and then has iodine and an anti-caking agent added. The latter prevents it from clumping in humid conditions. Kosher is compacted salt and does not contain iodine. In reality, any of them. The only recommendation I have for you is to use it in moderation.